Construction of a visitor’s center, patio, and parking lot at Santa Cruz Mission State Historic Park required archaeological monitoring and excavation. This park includes an adobe building constructed 1822-24 to house Native American residents of the mission; it is the best preserved example of such residences at any of the California missions. Stone building foundations uncovered during the project were part of an enigmatic pre-1824 building that was over 200 feet long. 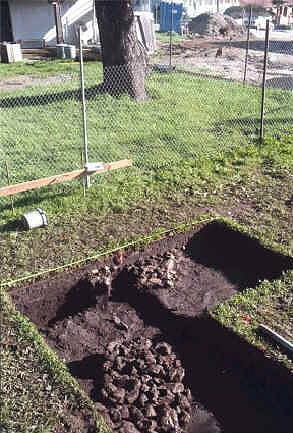 An 1840s refuse pit full of cow bone, roof tiles, and other artifacts was also excavated. This feature was probably associated with the Roman Rodriguez family, who acquired the property in 1839. Additional refuse pits were found in other parts of the project area. One dates to the late 1890s, and another to the 1930s. One highly unusual discovery was a ball-shaped "Phoenix button." Only one other such button has been reported from California. These buttons are associated with the late mission period (1830s). Archaeologists worked closely with the building contractor. He was born and raised in Mexico, and provided fascinating insights into traditional construction techniques. Stone foundation of earlier building behind the 1822-1824 Native American residence. 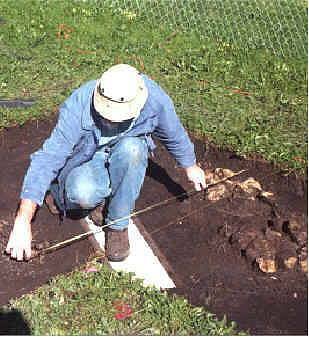 Archaeologist taking measurements to draw a plan showing stone foundations of early adobe building found during construction.